This group is dedicated to beautiful photos of sea, sun & clouds! Show us your best shots! 1. 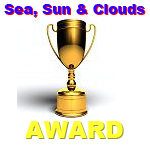 Give out two Sea,Sun&Clouds awards for every photo posted. 2. Posted photo main subject must be either Sea, Sun or Clouds. 3. Photo not conforming to rule #1 and #2 will be removed. 4. Enjoy browsing our group pool and flickr. Comments and faves to photos that you awarded! Giving out awards to The Greatest photos, your instant faves, eye catching, exquisite photos in this group. Please give out awards to photos that you really find amazing and write what is it that you like about the shot, why are you really giving out an award. There is not much point giving award if you do not make a comment. Please comment on a photo when giving out invite. We all like to hear what people think about our work, don't we? Please tag your photo "seasunclouds</strong>"
Please tag your photo "seasunclouds"
<strong>Please tag</strong> your photo "<strong>seasunclouds</strong>"
These are scripts for Firefox addon Greasemonkey. Another useful script for FireFox users is Super Invite Comment. It Puts two dropdown fields above comment fied on flickr where you can select to include "invite" or "vote" from groups into comment. Here you can download version of Super Invite Comment that includes invite and award code for Sea, Sun & Clouds group. Group created 03. April 2007.